Here's a card I made almost completely from snippets. I used a die-cut IO bucket and everything else came from my leftover bits. The pale pink panel had been previously cut and embossed with a next generation WRMK gemstone ef, and all the greenery had been previously cut. I just assembled the branches in the bucket, and punched tiny flowers from snippets with a SU! itty bitty punch, adding clear gems to the centers. The tag was die cut and stamped with a "for you" sentiment adding a black twine bow to the top. 4 black mini brads in the corners finished this one along with a bubble gum pink card base. I'm sharing this with the Snippets Playground weeks #303 & 304. Thanks for stopping by and have a good week ahead! Such a pretty card, Carol! 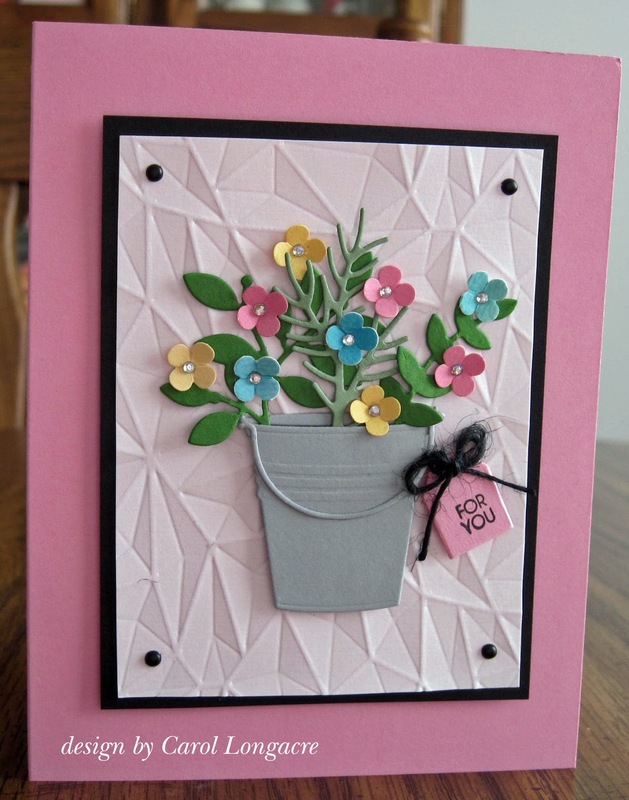 Love the embossed panel and your adorable bucket die filled with pretty flowers! I love your colors too! TFS and hope you have a great week ahead! Thinking of you & sending hugs!! So VERY pretty, lovely colours and the embossing folder is fab, love the bucket die too. 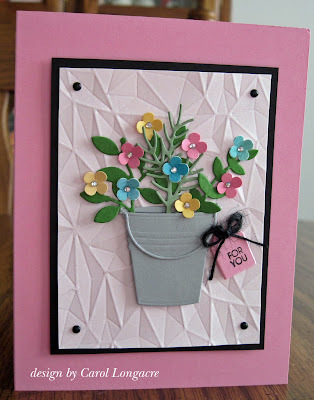 A pretty card Carol, a super embossed background and lovely flowers. So delicate and pretty. Your card totally makes me smile. Every time I see that embossing folder I admire it. So interesting. This is so pretty, and I just love when you use that bucket! Wow Carol - what a perfect snippets card! Wonderful how you made all those little flowers. I adore that EF you used - have tried a few times to buy it but it's always out of stock, sigh. Such a pretty card! Love putting my flowers in unusual vases like this pail.